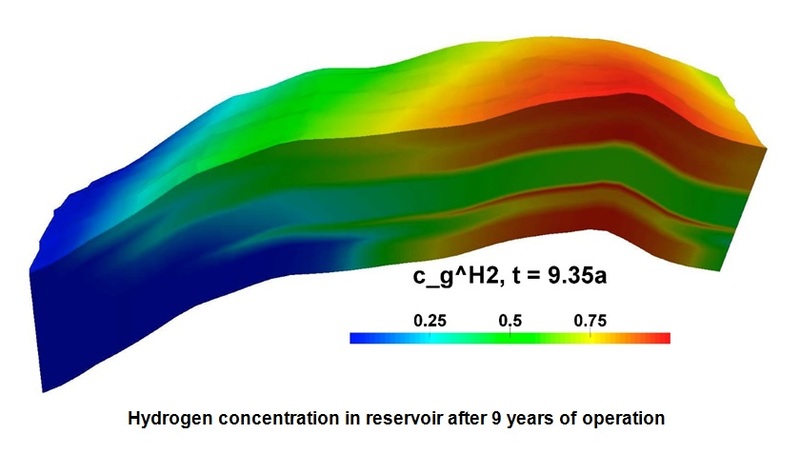 "Numerical simulations of reactions in near well bore areas of underground reservoirs considering reservoir operating conditions"
For the planning and operation of underground gas storage facilities, numerical simulations are performed frequently to predict the flow processes of gas and water in the porous storage rock. 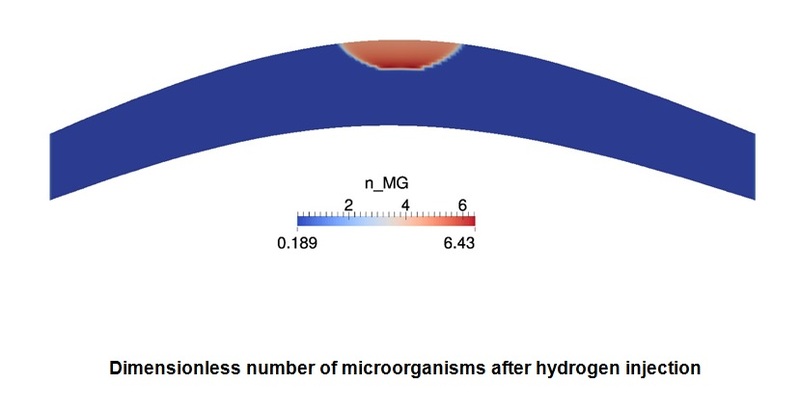 However, common simulation software cannot consider the microbial reactions and the resulting growth of biofilms. In this subproject, the development of coupled mathematical models, numerical implementations and exemplary simulation studies are planned. First, a theoretical model for the biofilm growth and detachment will be development on pore scale. The polymer networks combined with bacteria are modeled as non-Newtonian fluid phase. For the validation of the model, data from the University of Lorraine are used, which were obtained from a new experimental setup. On a larger scale the effect of pore clogging can be described by the stochastic Smoluchowski model of particle aggregation. In contrast, biofilm fragments, which have the size of single pores, cannot be considered as colloids. Another mathematical model, which describes the pore clogging effect by a particle trapping term, should be used for this case. Various types of the theoretical model should be solved numerically and analytically. The type, which matches the behavior in the near well bore area best, should be chosen to investigate the effect in a single well study. The experimentally determined parameters will be used to make first predictions for the changes in permeability and well injectivity. 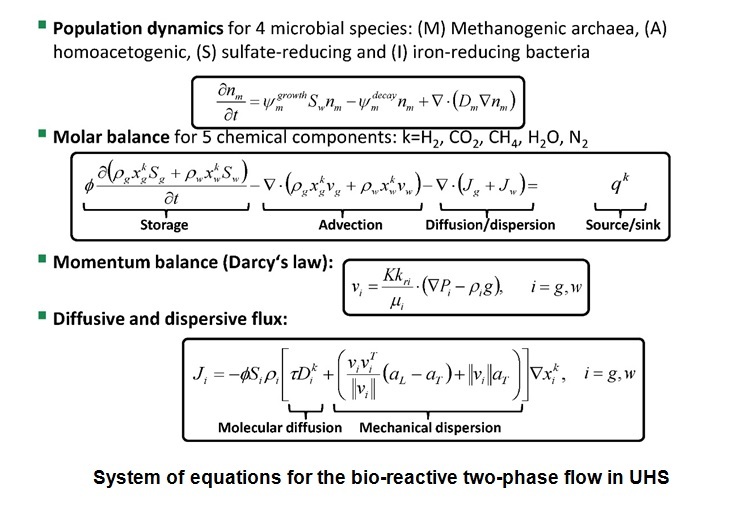 In previous work, a numerical code based on DuMuX was developed, which can simulate the hydrodynamic processes coupled with one biochemical reaction (methanogenesis). In the current project, the code was extended to simulate several simultaneous biochemical reactions. Additionally considered are homoacetogenesis and sulfate-reduction. The extensive simulations, which have up to one million degrees of freedom, were tested on the “Hochleistungsrechner Nord”. The test runs showed a good parallel efficiency using more than 100 processor cores. In the next steps an upscaling of the developed model for the near well bore area is planned. Here, it is important to see the same effect on injectivity and productivity on field scale. For the numerical simulations on field scale different geological models can be used. The storage cycles include alternating periods of injection, idle and production. 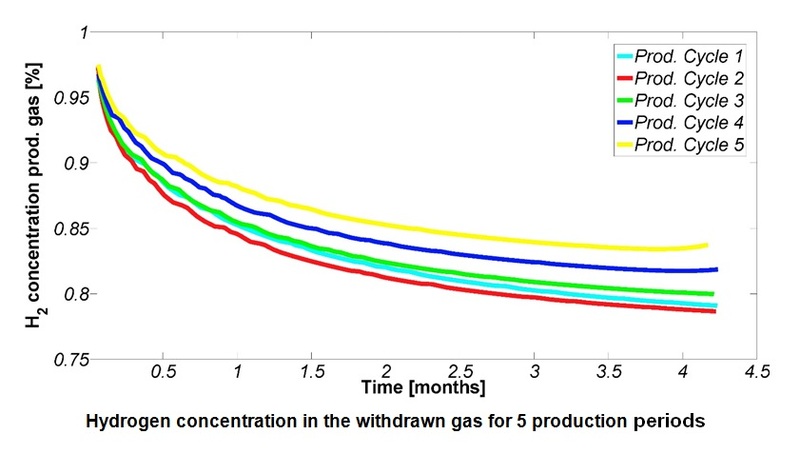 Based on the simulations, the variation in the gas phase composition over time can be concluded. Furthermore, possible leakage rates through the cap rock will be determined.